If you want to feel better, your hormones and thyroid medications need to be delicately balanced in a manner that is distinct to you. This is because your hormones are as unique as your fingerprint. Your hormones are like an orchestra and each instrument must be in tune for the melody – your life – to play harmoniously. The intricacies and individuality of your unique hormone structure means balancing your thyroid medications is primarily up to you. Sure, your doctor can help you with testing and guide you throughout your treatment, but it’s impossible for them to be as in tune as you are with the day-to-day impact your medications have on your life. It is up to YOU to find the ideal balance of thyroid medications that makes you feel your absolute best. Fortunately, we no longer live in a time where we are at the mercy of the closest doctor we can find. The internet gives you access to a wealth of knowledge that wasn’t available before, which means you don’t have to do this alone. 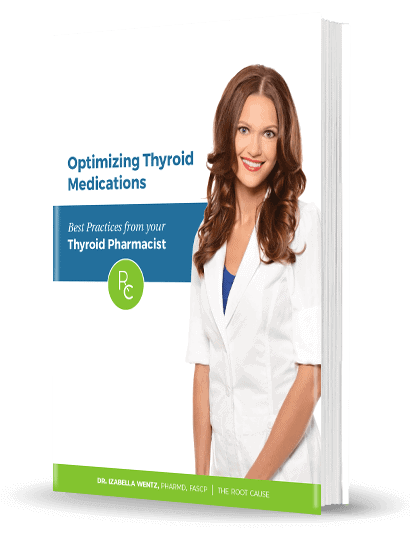 I believe information is power, which is why I’ve created a free guide to Optimizing Thyroid Medications. No matter where you are in your journey, Optimizing Thyroid Medications can help bring delicate balance back to your body and health. When you’re equipped with proper information, you can take matters into your own hands and ultimately feel your best. Individualized medicine is here, and I believe supplying people with the highest quality information is the key to health empowerment. I created this ebook, so you won’t have to blindly take thyroid medication without taking into account your individuality. Furthermore, this book was designed to help you achieve all of the above – FAST. While it does take time to manipulate and observe the changes in your thyroid medication, this guide will help you do so more efficiently and with intention. When you optimize your thyroid medications, not only will you feel better, but many of my patients have actually been able to reduce the amount of medication they need. That’s right – sometimes optimizing your thyroid medication means you won’t need as much as you’re taking now. Why am I giving away this free ebook? You might be wondering why I’m giving away such a valuable resource… This is simply because I see it as my mission to bring life-changing information about thyroid conditions to those who are struggling. If actually shouting from the rooftops would give everyone access to this important information – I would do just that. My personal journey with Hashimoto’s set in motion the next decade of my life, which has been devoted to helping others with thyroid disease. Helping you find solutions to get your life back is my passion and my life’s work. In fact, when you receive Optimizing Thyroid Medications, I want to send you THREE more free gifts. Gift #1: A Free Chapter of my book on Depletions and Digestion – Are you helping or hurting your gut? This chapter examines common habits that can contribute to impaired gut function as well as recommendations to support your nutrient absorption and digestion. Both of which are key elements to improving your daily life. Gift #2: The Thyroid Diet Quick Start Guide – This gets you on track to eating right for your thyroid – and fast. This guide is straightforward, fool-proof, and easy to get started right away. Gift #3: 10 Delicious and Nutrient Dense Gluten-Free Recipes – Healing food can also be downright delicious. These 10 recipes are well-loved by my patients and are now available to you. It worries me that 1 in 5 Americans have hypothyroidism and only half of them know it. Plus, an estimated 90-97% of those with hypothyroidism actually have Hashimoto’s. Yet, many doctors don’t test or tell their patients they have Hashimoto’s because they only treat the symptoms. This leaves patients ill-equipped and with incomplete information regarding their condition. I’m Dr. Izabella Wentz, and it’s an honor to be part of your health journey – It is my sincere hope that this ebook helps you feel better. Get your FREE Optimizing Thyroid Medications ebook and THREE additional gifts when you enter your email below.